The piezoelectric materials that are in everything from cell phones to musical greeting cards may be getting an upgrade thanks to work detailed in the journal Nature Materials released online Jan 21. Xiaoyu ‘Rayne’ Zheng, an assistant professor of mechanical engineering in the College of Engineering at Virginia Tech, and a member of the Macromolecules Innovation Institute, and his team have devised techniques for 3D printing piezoelectric materials that can be custom designed to convert movement, impact, and stress from any directions into electrical energy. “Piezoelectric materials convert strain and stress into electric charges,” Zheng explained. The above image, shows a printed flexible sheet of piezoelectric smart material (Photo by H. Cui of the Zheng Lab). Piezoelectric materials were first discovered in the 1800s. Since then, manufacturing technology advances have led to the demand for clean-rooms and a complex process that makes films and blocks that are attached to electronics after machining. The costly process and the intrinsic brittleness of the material, has restricted the ability to maximize the material’s potential. Zheng’s team developed a set of 3D printable topologies that let them manipulate and design arbitrary piezoelectric constants, which result in the material generating electric charge in response to incoming forces and vibrations from any direction. Unlike conventional piezoelectrics in which the inherent crystals prescribe the electric charge movements, the new method lets users dictate and program voltage responses to be magnified, reversed, or suppressed in any direction. Specifically, they additively produced free-form, perovskite-based piezoelectric nanocomposites with complex three-dimensional architectures. Then, they were able to customize the material’s resulting voltage response via selective suppression, reversal or enhancement with applied stress in any direction. Furthermore, they were able to achieve high specific piezoelectric constants and tailorable flexibility using just a fraction of the parent materials. One factor in current piezoelectric fabrication is the natural crystal used. At the atomic level, the orientations of atoms are fixed. However, Zheng’s team has created a substitute structure that mimics the crystal but allows altering and customization of the lattice orientation. The team successfully demonstrated the 3D printed materials at a scale measuring fractions of the diameter of a human hair. The material boasts sensitivities 5-times as high as flexible piezoelectric polymers. The stiffness and shape of the material can be tuned and produced as a thin sheet that approximates a strip of gauze, or as a stiff block. “We have a team making them into wearable devices, like rings, insoles, and fitting them into a boxing glove where we will be able to record impact forces and monitor the health of the user,” said Zheng. 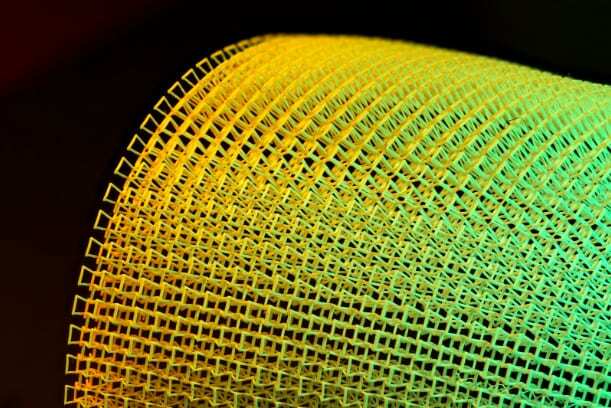 So far, the team has printed and demonstrated smart materials wrapped around curved surfaces, as well as worn on hands and fingers to convert motion, and harvest the mechanical energy, but the potential applications go well beyond consumer electronics and wearables. Zheng sees a potential for the technology in robotics, tactile sensing, energy harvesting, and intelligent infrastructure. In such applications, a piezoelectric material could enable the sensing of impacts, vibrations, and motions, and it allows these types of movements to be monitored and located. The team has printed a small smart bridge to demonstrate its ability to sense the locations and magnitudes of dropping impacts, while it is robust enough to absorb the impact energy. The team also demonstrated their application in a smart transducer that converts underwater vibration to electric voltages.